Did you know there were 12,400 kidney transplants in 1997 vs. 8,620 in 1986? Did you know about 20 million Americans are affected by kidney and urological diseases? Did you know kidney disease is one of the costliest illnesses in the U.S. today? Did you know more than 50,000 Americans die each year because of kidney disease? 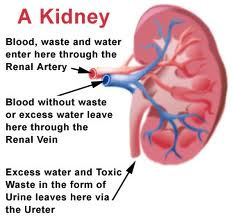 Did you know more than 260,000 Americans suffer from chronic kidney failure and need an artificial kidney machine (dialysis) or kidney transplant to stay alive? Did you know more than 35,000 patients are waiting for kidney transplants, but only about 11,000 will receive transplants this year because of a shortage of suitable organ donors? Did you know diabetes mellitus (Type II adult onset) is the leading cause of chronic kidney failure, accounting for 35% of the new cases each year and 25 percent of all cases in the U.S.? Did you know uncontrolled or poorly controlled high blood pressure is the second leading cause of chronic kidney failure in the U.S., account for about 30% of U.S. costs? Did you know kidney and urological diseases continue to be one of the major causes of work-loss among men and women? Each year, about 27 million physician visits, more than 6 million hospitalizations and nearly 2.5 million surgical procedures in the U.S. result from kidney and urological problems. Did you know about 500,000 Americans suffer from kidney stones each year? Did you know one of the most common and most debilitating symptoms of liver disease is fatigue? Did you know many people who suffer from liver disease say their usual “pep” is now gone and that they experience weakness and a lack of energy throughout the day? Did you know alkaline phosphatase is a family of enzymes produced in the bile ducts, kidney, intestine, bone, and placenta? Did you know an elevation in the alkaline phosphatase level can be an indicator of liver and bile duct diseases? Did you know bilirubin is the major breakdown product that results from the destruction of old red blood cells? Did you know many different liver diseases cause the bilirubin concentration to be elevated in your blood? Did you know albumin is the major protein that circulates in the bloodstream and that low levels of albumin indicate poor liver function? Did you know that for someone with liver damage, a “the more the merrier” attitude toward protein intake can actually be dangerous? Did you know the liver is the body’s warehouse for storing nutrients like vitamins and minerals from the foods you eat and/or supplements? 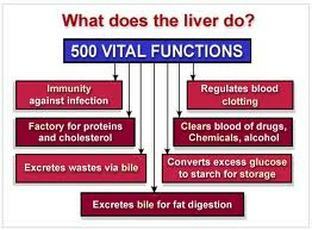 Did you know the excess amounts of nutrients the liver can not process/store are eliminated from the body? Therefore, simply taking vitamins and minerals just to be on the safe side may not be providing your body with any additional nutrients, especially if you eat a balanced diet?